Law is an exciting, dynamic subject, one which evolves constantly. It governs every aspect of our lives, from food labelling and football transfers to elections and crime. The study of law involves learning legal rules, interpreting, applying and critiquing legal principles. This requires the development of the skills of argument and advocacy as well as critical analysis and reasoning. Law: The course for you? If you like to be challenged and intellectually stimulated then a law degree is for you. Legal training requires the ability to think logically and critically, precise and careful use of language, good writing skills and a facility for articulate expression are key attributes for legal scholars. 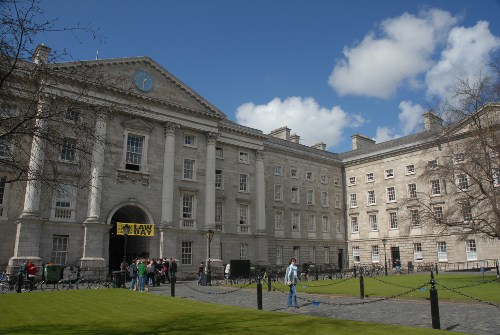 Trinity’s School of Law, is Ireland’s oldest and most internationally renowned law school. It is the highest ranked Law School in Ireland in both the QS and THE world rankings. We have a distinguished team of professors and lecturers and attract students of the highest calibre from Ireland and abroad. Our strong network of alumni in Ireland abroad comprises leading lawyers, judges, including Chief Justices, Presidents of Ireland, policy-makers and public representatives. The Law School has produced some of the most prolific lawyers of the modern era in Ireland. Our historic school is ideally situated for law students, being in close proximity to the Four Courts, the Houses of Parliament, and Dublin’s technology hub with firms such as Google and Facebook. By national and international comparisons we are small in size but our dedication to small group teaching fosters a friendly and vibrant relationship between staff and students, one inspired by mutual respect and co-operation. Creativity and independent thinking are amongst the key attributes we foster amongst our students. The School is home to one of Ireland’s leading legal periodicals, the ‘Dublin University Law Journal’ and the ‘Trinity College Law Review’. The latter is published by the student members of the University’s Law Society and now enjoys international dissemination. A law degree provides the ideal foundation for the aspiring solicitor or barrister. Our degrees in law provide students with a challenging and rewarding legal education but also instil more general skills such as critical thinking and problem solving. Our graduates go on to enjoy successful careers in the top law firms in Ireland, UK and abroad. The skills learned through studying law in Trinity are useful in all walks of life and offer wider opportunities than professional practice alone, with many graduates finding employment in public administration, business, journalism, accountancy, banking, insurance, politics, foreign affairs, diplomacy and international financial services both in Ireland and abroad. The School of Law enjoys a mutually beneficial and close relationship with its alumni. Every year our graduates working in leading Irish, UK and international legal and consultancy firms return to Trinity to offer internship and job opportunities to our students. Our annual Careers Fair and the TCD Law Society’s Careers Officer organise regular presentations and events for students to meet with potential employers. Your degree and what you’ll study? Law at Trinity is a four-year honours degree programme. Most of the teaching takes place at lecture level and is supplemented with seminars (small group teaching) in classes of between 12-15 students. Over the course of the programme, students will cover the fundamental building blocks of the legal system, including modules such as criminal law, constitutional law and EU law. Students will also take modules in related disciplines that contextualise their study of law. In the final year, most classes are small in size allowing students to learn from one another and from a distinguished academic in a ‘seminar’ style setting. In addition, students will complete a substantial piece of independent research, the Capstone project, through which they will develop vital skills of research, presentation and teamwork. The Law School has long recognised the value of practical, skills-based training. Clinical legal education (CLE) offers students a valuable opportunity to learn more deeply about the law by gaining practical legal experience. This module allows 30-40 students per year to undertake a placement in a legal practice setting in a partner organisation in the private, public or not-for-profit sectors. Alongside the placement, students attend a lawyering class in which they develop their understanding of professional legal skills and legal ethics. We are privileged to have many of the leading legal practice settings in the State, in each of the private, public and not-for-profit sectors, among its partner organisations which offer placements. The lawyering class complements the placement by enabling students to identify and develop the skills, values and knowledge which is necessary for making the transition from the academic study of law to its application in a real world setting. Assessment in law degrees is by a combination of coursework and semester examinations. As a reflection of the different teaching practices, a diverse range of assessment methods is used, including case notes, essays, mock trials, reflective journals, mock parliaments, contribution to web-discussion boards, response papers and research dissertations. Students are advised at the beginning of the teaching semester about the assessment methods in each module. In third year, students have the opportunity to apply to study abroad in a prestigious European university with the EU funded Erasmus programme. In addition to exchange programmes in Europe, the School of Law also has bilateral links with leading universities in North America, Australia, Hong Kong and China. Our exchange programmes are highly successful and are an extremely popular option for law students each year. Participating students find that they are hugely enjoyable, academically and culturally rewarding, and a valuable asset to prospective employers. Garrett Simons, LL.B. S.C. Garrett graduated with a first class honours degree in 1992. He is a Senior Counsel specialising in planning and environmental law, and the author of Planning and Development Law (Thomson Round Hall, Dublin). Note: Law (TR004) is one of three courses that are part of the feasibility study in admissions, and 10 places will be filled under this new route.